If you haven’t yet, you can read about my solo weekend trip here in Kapas Island as well. As said above, Kapas Island is an island located in Kuala Terengganu, Malaysia. The word “kapas island” translates to “cotton island” in Malay, referring to its white beaches. 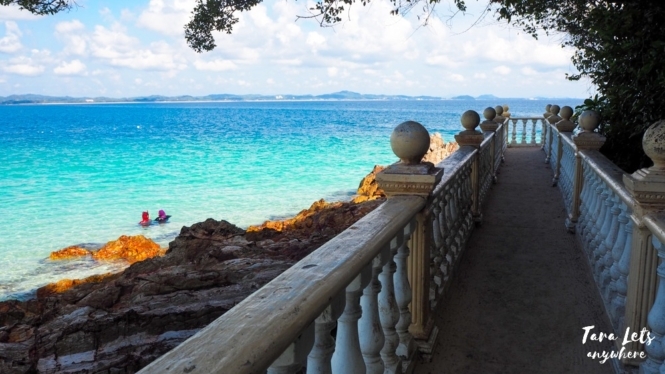 Its province Kuala Terengganu is actually a getaway to the best beaches in Malaysia — Perhentian Islands, Redang Island, Tioman Island and others. 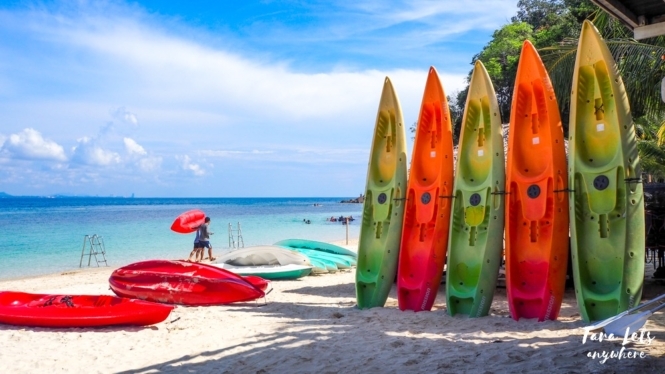 While Perhentian Islands and Tioman Island are known for diving and Redang Island for its exclusivity, Kapas Island is the best choice for those who want a more secluded beach vacation. Long beach in Kapas Island. One of the bridges connecting the beaches. How many shades of blue can you count? Kapas Island has about 5-6 main beaches, which are connected through bridges. You can walk end-to-end in about 30 minutes or so. 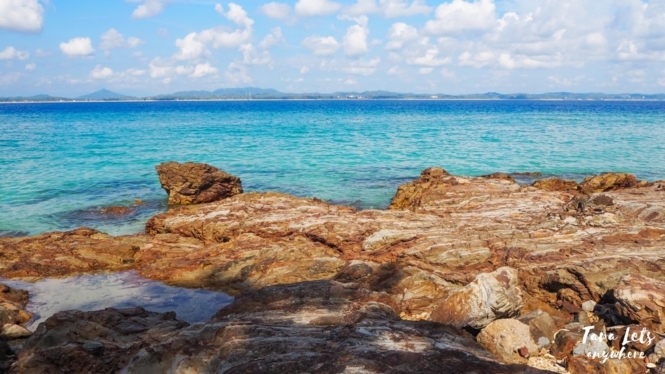 The best time to visit Kapas Island is from April to August. 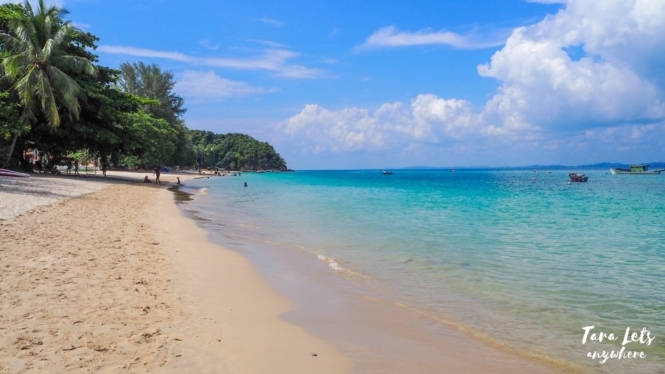 Like other beaches in Malaysia, it’s closed from November to February due to the monsoon season. It may open early in February to give way to vacationing locals for the Chinese New Year, so if you’re here during that month you can always inquire with the resorts if they are already open. From Kuala Lumpur, you can take a flight to Kuala Terengganu and then a taxi to Marang Jetty (not to be confused with Merang Jetty). 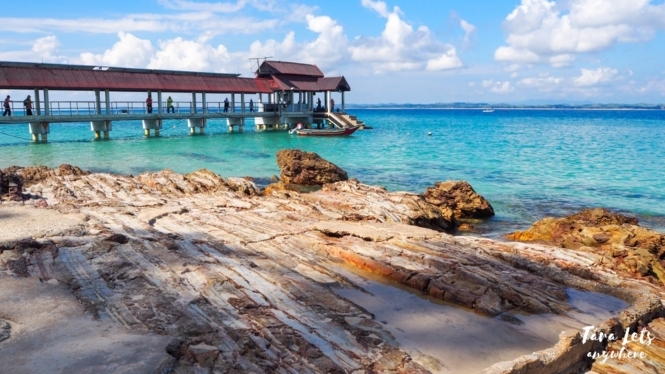 From Kuala Lumpur, catch an overnight bus to Kuala Terengganu (RM44). Get off at MBKT bus terminal. You can book online via Easy Book or Bus Online Ticket. Make sure to printout the confirmation ticket in your email and show it at the bus station. Travel time is about 7 hours. From the MBKT bus terminal, take a bus that will drop you off in the town of Marang and then walk for a few minutes to the jetty. If you arrive early in the morning or late at night, there might not be buses available going this route. Another (and much easier) way is to take a taxi or Grab (about RM20-25). Travel time is about 20 minutes. Tip: There are food stalls in the bus terminal so you can have a breakfast there first before proceeding to the jetty. I went here for a weekend only, and in such cases I suggest taking the 10PM or 11PM buses in Kuala Lumpur so you won’t have to wait long in the morning. From the terminal in Kuala Terengganu, I took a Grab to Marang jetty. Easy peasy. Jetty upon arrival in Kapas Island. The best thing to do in Kapas Island is to lay down on a hammock and beach bum. Seriously, this place is amazingly quiet and peaceful. Most accommodations also have their own stock of books, which is free to peruse. Aside from relaxing, you can also snorkel. Kapas Island is part of the Marine National Park so you’re guaranteed good underwater sights. You can pay for a snorkeling tour or just swim in the beachfront of your accommodation. There are rentals for life vest (RM5) and snorkel (RM15). Other activities include jungle walk and day tour in the nearby Gem Island, which (I’ve read) can be arranged by the Longsha Campsite. There are a few restaurants you can choose from, so eating is not actually a problem. I went to the Kapas Island Resort Restaurant and would recommend their yellow coconut fresh lobsters (for lunch and dinner), as well as the banana pancakes in the KBC restaurant (for breakfast). If you want budget meals, you can go to the JT Cafe. Meals are more expensive in Kapas Island than in the mainland, but still within reasonable rates. Prepare about RM15 for one meal. I stayed in Captain Longhouse and would highly recommend this one. Like others in the island, the two-story building has a quirky feel. There are private rooms and beds in dorm available. There are several hammocks outside where you can lie down all day, and a kitchen that is open for breakfast. It’s at one end of Kapas Island, so the beachfront is more deserted than others — particularly in comparison with that of resorts near the jetty. The staff is also very friendly. I wasn’t able to ask the name of their guy assistant, but he’s the one with glasses. Please say hi for me! 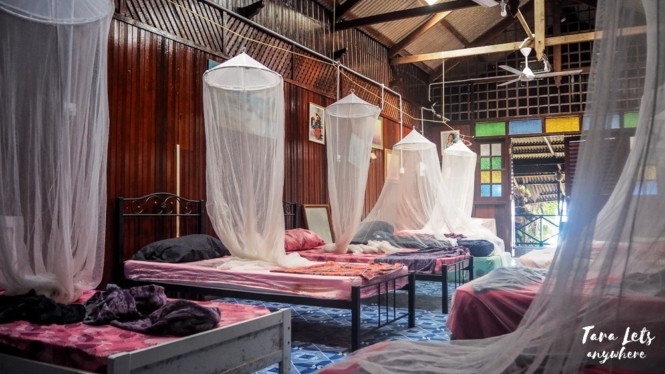 Dorm room in Captain Longhouse. Captain Longhouse isn’t strict about checkin/checkout times, and rate is calculated per night. I checked in at about 10AM and checked out at 3PM and paid only RM50 for the dorm slot. 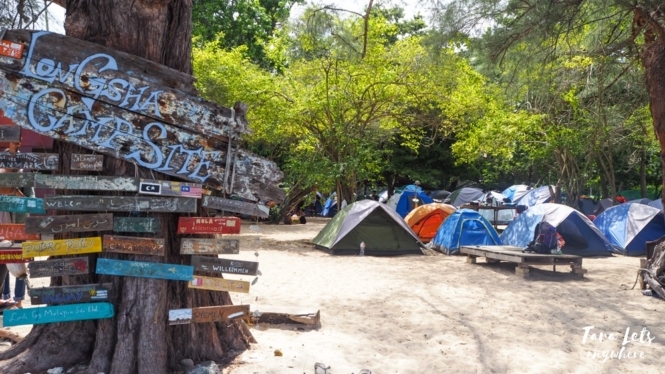 If you’re on a budget, you can always book for a tent or slot in a dorm. I find that private rooms for one person are also not that expensive. For instance, chalets in Kapas Beach Chalet (KBC) cost only RM70-90 per night. 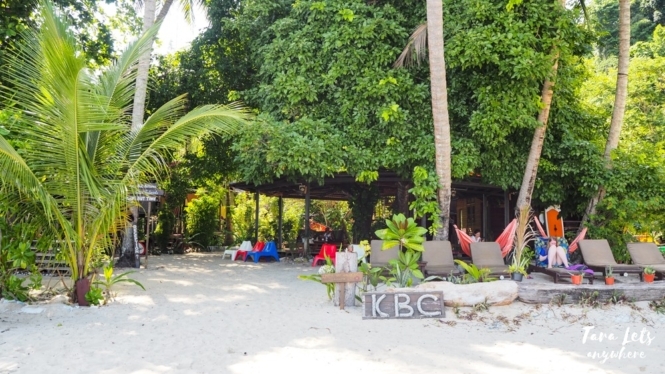 Kapas Beach Chalet or KBC. You can also stay at the nearby Gem Island Resort & Spa – click here for discounted rates. Give back? It takes time for us to write these guides. As such, we’ll appreciate if you can book through our affiliate links, at no extra cost to you! There’s really no high-peak season in Kapas Island, but if you’re going on a long weekend (including days where Thursday or Tuesday is a holiday and people take a leave in-between) make sure to book the bus tickets and rooms in advance. Cash. There are no atms in the island. Other items such as sunblock can be bought in the island. That’s it. 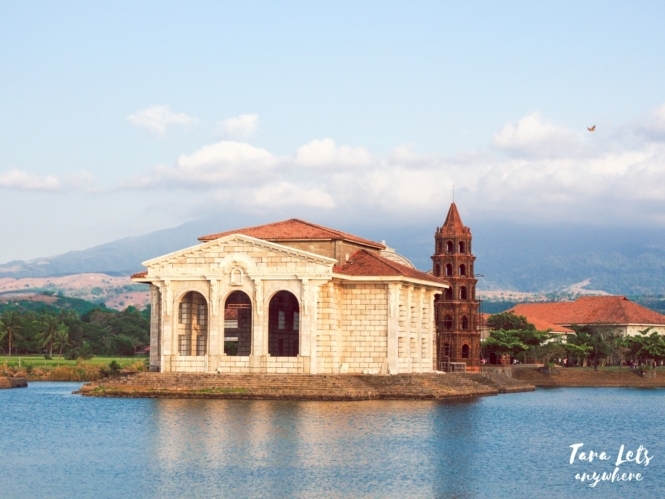 Hope you enjoy your trip to Kapas Island as well! Like this post? Save it in Pinterest! I love traveling off the beaten tracks as I believe you can only get to know a country, its tradition, culture and the people when doing that. Your pictures look stunningly beautiful. Thanks for sharing.